Contact is a 1997 science fiction film adapted from the novel by Carl Sagan. 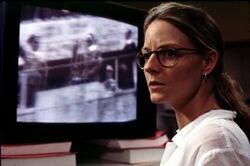 Directed by Robert Zemeckis, it stars Jodie Foster as Dr. Eleanor Ann "Ellie" Arroway, Matthew McConaughey as Palmer Joss, James Woods as National Security adviser Michael Kitz, and Tom Skerritt as Dr. David Drumlin. The film opens with a montage shot of Earth in space, with a loud background noise made up of radio and television signals from recent years. As the camera pans out, the transmissions become older, until the camera loses sight of Earth, the Solar system, and the Milky Way in an unimaginably vast, silent universe. The main protagonist, Ellie Arroway, is introduced as a child, living with her father in Madison, Wisconsin and obsessed with amateur radio. 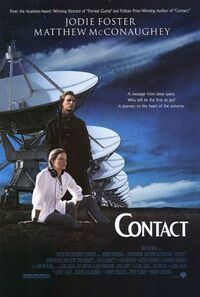 After a scene in which Ellie asks her father if humans can talk to other planets, and if there are other civilizations in the universe, the scene changes to Arroway in her late 20s, a brilliant scientist and researcher working on the SETI program, using the gargantuan Arecibo radio telescope in Puerto Rico for her research. While working at Arecibo, Arroway meets Palmer Joss, a student of theology researching for a book on science's impact on the Third World. He gives her a compass from a Cracker Jack Box. He says that someday it might save her life. They start a romantic relationship. At this point it is revealed that Ellie, whose mother died during childbirth, lost her father due to a heart attack when she was still a child, before they were to watch a meteor shower. Despite her commitment to the SETI project and her scientific genius, Arroway is unknown amongst the academic community, and is ridiculed by her former teacher, Dr. David Drumlin, an officious, pompous, arrogant man who has been promoted to Chief of the National Science Foundation and Science adviser to the President of the United States. Drumlin arrogantly tells Arroway that her research is a waste of time and public money, and shuts down the project. The team, including the blind, brilliant astrophysicist Kent Clark, leaves Puerto Rico, and for an unknown reason, Ellie deliberately does not telephone Palmer Joss, effectively ending the relationship. With the help of friends and partners from the Puerto Rico site, Ellie spends the next thirteen months trying to find a new source of funding for her research. During a presentation to a board of directors at the fictional Hadden Industries Inc., Ellie loses her temper and is ultimately awarded a large grant from the corporation's reclusive owner, billionaire industrialist S. R. Hadden (John Hurt). Leasing time from the government-owned Very Large Array of radio telescopes in New Mexico, Ellie and her colleagues spend the next four years combing the skies. Yet again, Drumlin intervenes, and recommends to the government that they cancel Arroway's lease contract in favor of more legitimate research. But that very night, Arroway herself detects a signal of unknown origin being picked up by the radio telescopes. In a frenzy, Arroway and the team realize the message is being transmitted as a sequence of prime numbers, and trace its origin to the star Vega. The team passes the coordinates to radio telescope stations across the globe and, realizing that they have found an artificial signal that can only have come from an advanced alien civilization, they release their information across the world. Arroway sees the Hitler footage from Vega. Overnight, the New Mexico facility becomes the scene of an international media circus. Dr. Drumlin arrives at the site with the American National Security adviser, Michael Kitz (James Woods). While Drumlin pompously tries to direct operations at the site, Kitz chastises Arroway for having breached National Security policy by sending the message around the world. Arroway and Kitz begin a heated argument, and at this point, Kent hears a complex interlaced audio structure woven into the sequence of prime numbers. The team quickly discovers that this sideband of additional data is interlaced with a television image. The team feeds the signal into a television set, which reveals that the television signal is footage of Adolf Hitler, making his opening speech at the 1936 Olympics in Berlin. Though the Hitler footage causes governmental panic, with Kitz demanding to militarize what he sees as a conflict with a pseudo-fascist civilization, Ellie points out that the Olympic broadcast was simply the first television transmission powerful enough to travel into space. Though Kitz concedes this point, Ellie is increasingly ignored by the government and media as Drumlin begins to take credit for her discovery. Meanwhile, in New Mexico, what was thought to be noise amongst the frames of the Hitler footage is found to be tens of thousands of pages of data written in an undecodable alien language. After several failed attempts to decode the language, Hadden, on an overnight meeting with Ellie, reveals to her that he has discovered that the encrypted data sheets fit together in a 3D fashion, revealing complex blueprints for some sort of mechanical device. This information gives Ellie renewed political power, and she returns to Washington D.C. where the Cabinet meets to discuss theories on what the machine does, and whether or not it should be built. Despite her insistence that the machine's designers are likely to be peaceful, Arroway is confronted with officials who worry about the "morally ambiguous" and potentially godless nature of the civilization, fearing that the machine is a weapon of mass destruction or a Trojan horse. Ellie is supported by Palmer Joss, who has become the personal religious adviser to the President. The President himself (shown as Bill Clinton) eventually decides to authorize the United States to build the machine, which is identified as an interstellar transport device designed to take a single human occupant into space (presumably Vega). The reunited Joss and Arroway start another romantic relationship. Construction begins in Cape Canaveral, Florida on "The Machine," which is basically four concentric rings with a crane above it, from which the passenger pod is dropped in. The astronomical cost of construction and technology rights are split between several different nations, with the International Machine Consortium (IMC) managing overall construction and operation, and an international committee of scientists, philosophers, theologians, and politicians formed to select a suitable candidate to make the journey. Joss is included in the committee and Ellie is among the potential candidates, preventing them from spending much time together. Dr. Drumlin resigns from his government post in order to become a candidate, and he and Arroway become the main contestants for the machine seat. While being questioned before the committee, Ellie is forced by Palmer Joss to reveal her atheism, and Drumlin is eventually chosen to make the journey. It is implied that the committee did not want to select a candidate who doesn't represent humanity's belief in a higher deity. Ellie ends her relationship with Joss and stays with the project as a technical adviser. The day of the Machine's first full-scale systems test is a widely-attended celebratory event, but Ellie notices that a religious fanatic (Jake Busey) she had previously encountered has infiltrated the site by posing as an employee. She alerts Drumlin to his presence, but before Drumlin can stop the explosive-strapped fanatic, he commits a suicide bombing, killing Drumlin and dozens of technicians, and destroying The Machine. Soon after the Cape Canaveral disaster, Arroway receives a communication from Hadden, who is now living on the Mir space station in an attempt to delay the progression of his cancer. Hadden informs Ellie of the existence of a second Machine, secretly built by his corporation in Hokkaidō, Japan, and tells her that the International Machine Consortium still wants her to go on the journey. Ellie travels to Japan, where Palmer Joss meets her and reveals that his acts at the committee hearing were influenced not entirely by his professional beliefs, but also by his personal fear of losing her. He makes peace with her going on the second Machine, which is then announced to a stunned world. On the day of the test, Ellie is learning about the restraint system. She says that if the aliens had meant there to be a restraint, they would have designed one. The team also gives her a suicide pill in case something should happen. Ellie enters the Machine's transport pod (IPV) assisted by two technicians. As the Machine begins to build up power, the rings transfer their energy to the pod, which makes the interior metal of the pod begin to turn slightly translucent. 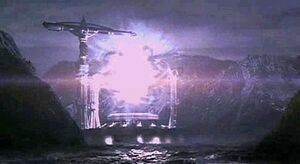 Her communication signal becomes fuzzy as the energy field increases, and the rings begin to create a massive energy vortex in the core of the machine. The Machine becomes structurally instable and the team prepares to abort, but Kent picks up Ellie's faint voice telling the team she is ready to go. The team agrees to go ahead, dropping Ellie's transport module into The Machine. Inside the pod, Ellie travels at immense speed through a series of wormholes, while the translucence of the pod allows her to see all around her. She then stops briefly in the Vega system, where she sees a complex radio antenna (the one that originally transmitted the message) that could have only been built by a highly advanced civilization. She is then pulled into another wormhole, and is transported at greater speed to a quadruple-star system, where she sees a planet that appears to have cities and indications of advanced alien life. The pod is then pulled into another, much more violent wormhole. She then gets out of her chair to grab the compass given to her by Palmer Joss. The pod's violent vibration causes the restraint system to detach and shoot against the wall of the pod. She finds she has been transported to the site of a celestial event so beautiful she cannot describe it. After losing consciousness, Ellie awakes on a surreal beach that resembles a childhood drawing she made of the beach at Pensacola. She sees a transparent entity moving toward her, which slowly takes the form of her deceased father, and overcome with emotion, embraces him. She then realizes that she is in a simulated environment based on her thoughts and memories. She talks briefly to the alien who has taken her father's form, who tells her that they were just listening to earth instead of deliberately contacting them, and that there are many other civilizations, who they all try to contact and bring them to themselves via the transportation system, which was already there when they arrived at this place. She is told that she cannot take back any proof to Earth, because "it's the way it's been done for billions of years." He adds that they made the first step (of potentially many) in contacting Earth because, in the immensity of space, "the only thing we've found that makes the loneliness bearable is each other." Before she is sent back, they witness a huge meteor shower, and so they finally get to watch the meteors together. Ellie wakes up inside the transport pod and is told that the pod simply dropped through the Machine without going anywhere, a fact supported by forty-three separate cameras. With opinion divided as to whether Arroway made the journey or simply hallucinated it, Kitz heads a Congressional inquiry and argues vitriolically that the entire project was a perverse multi-billion-dollar hoax orchestrated by Hadden (who has just succumbed to cancer.) Arroway admits that, in accordance with Occam's Razor, the hoax theory is the more logical explanation, but that she continues to believe her journey took place. As one Congressman points out, the atheist Ellie is put in the ironic position of asking the public to accept her unsupported personal experience based only on faith. Ellie leaves the hearing with Joss, who embraces her experience, and both are greeted on the National Mall by a large crowd of supporters to whom Arroway has become a prophetic figure. It is then revealed by Kitz that a secret report states that Arroway's video headset recorded approximately eighteen hours of static, the exact time Arroway claimed she was gone, despite the cameras showing her drop straight through the machine with no interruptions in descent. Though the information is suppressed, Kitz decides to continue to fund Ellie's SETI work. Ellie is shown 18 months later, giving a children's tour to the newly-expanded radio telescope array back in New Mexico, and is last shown sitting in the desert during sunset, looking not at the night sky but at a palmful of desert sand. The film ends with a backdrop of stars, with the words "For Carl" shown against them. The quest of a scientist for other civilizations is the theme. One theme that is well expressed by this film is the entrenched irrationality of people at all levels. Those who believe and those who do not believe are equally irrational. Public opinion that is highly valued is depicted here in its purest form: It is incapable of knowing its subject. It is insistent on its opinion. These are themes as old as our civilization. The film would not have been half successful if the technology part were removed. Popularity is for the technology and speaks about the character of popularity. Truth and popularity rarely go together. If they do, it is by coincidence. The scientist in Dr. Ellie Arroway that constantly asks for proof is unable to offer proof for her rare physical experience. Proof belongs to the physical plane; all life is NOT confined to the physical. Authority always has a substantial dose of falsehood. In times of crisis, as a rule, it is always the falsehood that wins, though not ultimately. Any trailblazer is deserted by life early. Ellie loses her mother and father. Every seeker is being watched by good angels is a theme well portrayed. Those aids come to Ellie as Life Responses - they precipitate into reality when she exhausts her efforts. Falsehood usurping truth can never succeed is seen in the life of Dr. Drumlin. When he takes over her accomplishment, the world around her is silent. It is a silent conspiracy or conspiracy of silence. The society at large rarely comes to the rescue of Truth. The Positive and Negative are two sides of life apparently opposite, really complementary. Sri Aurobindo often implies that the negative is greater or more powerful than the positive. In accomplishing Ellie's mission, the billionaire S.R. Hadden lives up to that principle. The blind man in the story, Kent, is a symbolic representation of human blindness, even when one espouses Truth and seeks it all one's life. In the West, individual Truthfulness is commendably high. It is the core of scientific research. In Ellie, it is at its height. The Truth that is partial is ineffective socially because of its being NOT a whole. Hence, Ellie's Truth often stumbles. Even when it physically succeeds, it is a social failure. Had it been whole, i.e. the Mind that is the part is either supported by the emotions or the Spirit, it would have become a social success. In The Matrix Neo's failure is made up by the love of Trinity. The WHOLE is neither Mind nor the emotions. Even the Spirit is only a part. But when the partial Mind is supported by another part the vital - emotions - its character of being partial is lessened and its effectivity rises. The real WHOLE is the Spirit in the Being, the Psychic Being, the evolving Spirit. All others are parts. Rachel Constantine, the black lady officer in the White House who discovers that Ellie actually traveled for 18 hours, in conjunction with Michael Kitz, the National Security adviser, suppress that fact and let people believe that Ellie traveled for only one second. Even in a society where Individuals are extremely personally TRUTHFUL, in times of crucial decisions, ONLY falsehood will prevail. Individuals wedded to TRUTH are not enough to serve TRUTH or make the collective consciousness serve TRUTH. Hence the extreme importance of Truth. The September 11 attack on World Trade Center by the abominable terrorist gang has its 'rationale' in that they were the negative instruments of a positive service to humanity. They are really at war with the organized hypocrisy of international diplomacy. Neither USA nor Europe will be able to eradicate terrorism without giving up this poison in the soul of the nation. Osama Bin Laden too serves God in his own way.